In the slums of Kenya, money is especially scarce. Still, the residents are productive and have plenty of goods and services to offer one another. American social entrepreneur Will Ruddick, together with hundreds of local enterprisers, has found a way to create supplemental exchange media that enable them to trade with one another despite the lack of Kenyan shillings. Here’s a new video about their Bangla-Pesa currency that they have created in Bangladesh, a slum area of Mombasa. Published on Apr 10, 2014. When news of the complementary currency branded Bangla-pesa first broke out, claims arose that it was linked to the proscribed Mombasa Republican Council, MRC, and its secessionist agenda, almost spelling doom for the project. A year later, we returned to Bangladesh slum in Mombasa county where the vouchers were first launched, and discovered that not only has the program grown in leaps and bounds, but plans were afoot to roll it out in different slum in the region. Every day brings new stories about the successful application of new exchange mechanisms that are helping people to survive and thrive in the face of monetary dysfunctions and misguided government policies that are becoming ever more prevalent. This report from Kenya is a moving and inspiring account of one aging woman’s efforts to keep her family fed and housed. Maciana Anyango’s husband died a long time ago, leaving her with 5 children to care for alone. Even though she is 64 now, and most of her children are grown, she still bears the burden for caring for her family. Her oldest son, who might have taken on this responsibility, also died, and her oldest daughter is disabled from a bout of TB. Her surviving son was trained as a driver, but he’s been unable to find work, so he, his wife, and his two children live with Marciana, along with Mariciana’s disabled daughter and youngest daughter (17 years). Marciana didn’t have the money to send her youngest daughter to secondary school. And, although she received some training as a tailor, she is also unemployed. So, Marciana supports this household from the sale of porridge and a bean and maize soup. The porridge sells for 15ksh ($0.18) and soup for 10ksh ($0.12). She usually makes around 600ksh ($7) a day to feed a family of 7. Technically, this puts her above the international poverty line based on the lower cost of living in Kenya, but, as she leaned her forehead against a pole, looked down at her worn red flip flops and dust covered feet, and told us about her life, we could feel the exhaustion caused by her efforts to keep her family fed and housed, and some sadness at being unable to keep her daughters in school and in good health. And a world away in the United States, commercial trade exchanges (sometimes called “barter exchanges”) are continuing to proliferate and develop in ways that promise to make moneyless trading mechanisms ever more effective and accessible. Trade Authority is an entity that is promoting the proliferation of member-owned trade exchanges and plans eventually to network these exchanges together to enable members to spend their trade credits over a wider area. View their introductory video here. Despite a half a lifetime of work and dedication, the world has yet to heed my advice and conform itself to my view of how it ought to be. So there it is. There’s the root of my late-life discontent. My muse tells me that I ought to lighten up and enjoy whatever time I might have left; the world will muddle through, with or without me. Maybe I’ll take up the challenge to become a stand-up (or sit-down) comedian. In the meantime, while I try to hone that skill, I offer below a few bits of hopeful (and not so hopeful) news and an overview of my recent travels, including links to my photos which you can browse at your leisure. Bangla-Pesa officially relaunched in partnership with the Kenyan Government. You may recall earlier reports about the Bangla-Pesa community currency project that launched in Kenya last May. One of the most promising community currency projects on the current scene, Bangla-Pesa quickly ran into a major roadblock in the form of government interference that included unfounded criminal charges against the organizer and five board members. We are extremely pleased to learn that all of that nonsense has been sorted out and the Bangla-Pesa project is now back on track. According to project founder, Will Ruddick, Bangla-Pesa has just been relaunched, this time with official government support. Ruddick states that the relaunch celebration included several government representatives who have unanimously requested that the program be replicated in other areas in the county as a means of reducing poverty. You can read the details at http://koru.or.ke/bangla-pesa-relaunch. Heinberg is surely right about that, but how are we to get out of the predicament we are in? 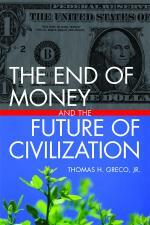 I have said repeatedly that our financial system is set up to require continuous and accelerating growth, that creating money based on banks’ lending at interest results in exponential growth of debt, which, in turn, forces exponential growth in economic activity to justify further growth in debt to prevent financial collapse. All of the major central banks, the Federal Reserve, the Bank of England, The Bank of Japan, and the European Central Bank, have been buying government bonds to keep the system going and avoid the inevitable shift to a steady-state, resource efficient, non-polluting economy. How long can the monetary authorities continue to inflate their currencies under the euphemistic rubric of “quantitative easing” (QE), without causing prices to spin out of control? If they were to stop, however, that would cause a cascade of defaults, financial market chaos, and major global economic depression. They are between a rock and a hard place. Well, not quite so simple. The debt limit has been raised and the government shutdown ended as everyone knew it would be, but there is still no sign that the powers-that-be have any interest in promoting a “post-growth, post-fossil fuel economy.” To undertake such a mission would require that they give up the “usury game” and the central banking system that has enabled them for so long to centralize power and concentrate wealth in their own hands, and that they surrender power to the people in a government that is truly democratic. No, the massive changes required must come from the bottom, from creative efforts that result in new structures, especially of exchange, finance, and cooperative enterprise, that reduce our dependence upon the dominant systems and make them irrelevant. 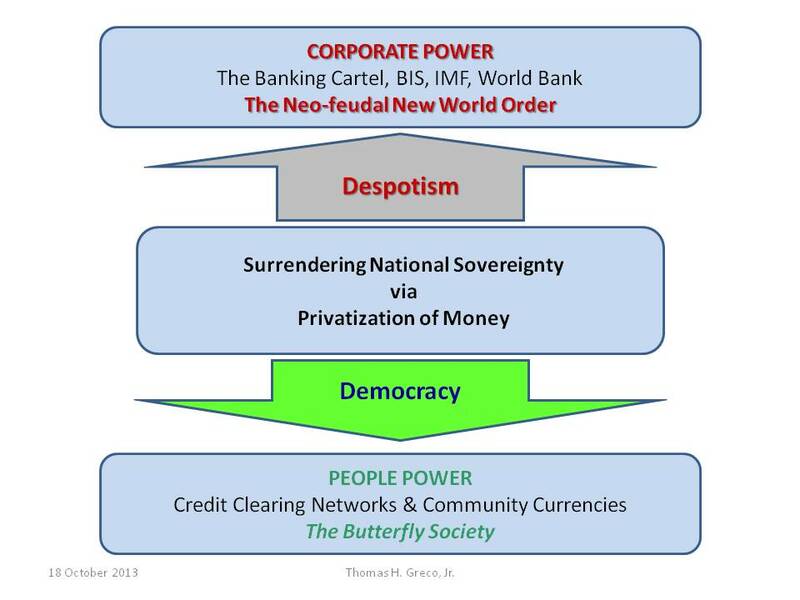 The prescription I’ve provided in my books and presentations for creating a new world order in which the people govern instead of a global elite oligarchy is to Share, Cooperate, and Restructure. We must recognize that the seat of sovereignty is the individual, not in isolation, but as a free moral agent within a convivial community, we must assert our independence from the dominant political, economic, and financial power structures, and we must organize new structures, under local control, that empower people and provide for the basic needs of all. Our urgent need is to transcend the global interest-based debt money system, but digital commodities like Bitcoin are not the answer any more than a return to using gold, silver or other real commodities as payment media. The better and more complete answer to the money problem in the one I’ve been proposing in my books and presentations for many years. What I foresee is a global network of small credit clearing exchanges that proved a means of payment that is locally and cooperatively controlled, yet globally useful. Thanks to the good graces and enormous efforts of Matthew Slater, my ReinventingMoney.com website has been redesigned and relocated to WordPress. The url remains the same, http://reinventingmoney.com/. ReinventingMoney.com is mainly an archival site for researchers that was compiled several years ago. If you are aware of any useful material, such as case studies, correspondence, or academic treatises that are particularly important, please send us a description and the link or file. Also, I’d be grateful to have a volunteer willing to help maintain that site. My active site is https://beyondmoney.net/. My current odyssey began on Nov 13 when I boarded a plane for Istanbul where I gave a presentation at the Green Economy and Commons conference. After spending a few more days exploring the city, I flew on to Kuala Lumpur, then a couple days later went by bus to Georgetown on the island of Penang, a world heritage city and my favorite place in Malaysia. On December 5, I began my month-long Cambodia adventure, making stops in Phnom Penh, Sihanoukville, Otres Beach, Kampot, Kep, and Siem Reap where I visited the amazing ruins of Angkor Wat. Since January 3, I’ve been in Thailand. Chiang Mai is one of my old haunts and a good place to get my teeth cared for at very reasonable prices. My Cambodia visit got off to an inauspicious start. After checking into my hotel, I decided to take a stroll down by the river. While crossing the street through relentless traffic, I got sideswiped by a motorbike that went roaring past in the far lane. I managed to get to the other side and sat down on a convenient bench where I almost passed out. My left shin was skinned and bruised in a couple places, but needed no stitches. I got some aid from a British friend I had been traveling with for some days, and a Polish couple who happened to be passing by. My wounds have fortunately healed well by now and I seem to be none the worse for it. One should not miss an opportunity to visit Siem Reap and Angkor. The ruins of Angkor are numerous and cover a vast expanse. Angkor Wat is only part of it. Exploring them requires a lot of walking and climbing, though, as vehicles can take you only so close. Cambodia is certainly a third world country with much inferior infrastructure but it is rapidly developing with help from outside and gearing up to be a major tourist destination. The people are friendly and helpful, and you can find accommodations at every level from backpacker hostels to luxury hotels. In Kampot I had a nice clean room with private bath, hot shower, free Wi-Fi, and cable TV for $8 per night. One thing that is noticeably strange about Cambodia is the fact that I had no coins jingling in my pocket. Strange, too, is the fact that market transactions are conducted mostly in U.S. currency. Yes, Cambodia has its own currency, called the Riel, with an exchange rate of about 4,000 riels to the dollar, but ATMs dispense dollars, and riel notes are used only as small change. Prices are typically stated in whole dollars and quarter dollars. So, if I buy a restaurant meal for $3.75 (not an uncommon price there) and I tender a five dollar bill to pay, I’ll generally get back in change a one dollar bill and a 1,000 riel bill. The smallest denomination note I saw, though not a very common one, is 100 riel, which is considered to be worth one fortieth of a dollar or two and half cents (and we in North America quibble about keeping the penny). By the way, I’m keeping my Verizon wireless account active. The number is 520-820-0575. I don’t keep that phone turned on while I’m abroad so you won’t reach me directly that way, but you can leave a voice message (I cannot retrieve text messages) and I will get it when I check messages every few days. I do have another mobile phone with me and as long as I’m in Thailand, you can reach me at +66 93 170 2910. I’ve been invited to give a presentation at the 4th Green Economy Conference, Green Economy and Commons, 16-17 November 2013, in Istanbul, Turkey. As a panel member on the 16th, my topic will be, Reclaiming the Credit Commons: the Key to a Green Economy and Global Harmony. Now, as we approach the end of a very busy and demanding year, I’m feeling the need for rest and renewal, so my intention is to travel onward from Turkey to southeast Asia where I will take a lengthy sabbatical. I will try to remain in touch, but don’t be surprised if email messages are not answered promptly. If your communication is really important, mark it “urgent” and keep trying, or Skype me. Following the Hague conference, I travelled to Sweden for a two week stay (June 24 to July 8) during which time I gave presentations and met with community currency activists in Gothenborg, Lindsberg, Gotland, and Stockholm. We had a wonderful evening yesterday! We were around 50 people, including us. I was content with that (I had no idea of how many might come)! The evening started with a mini-concert; a leading violinist (Helga Hussel) accompanied by Barbro Fridén on accordion, playing Pearls of World Music. It was lovely listening to them in that very nice building, good acoustics! After that I spoke a little…making a bridge between Charles Eisenstein’s recent presentation (Approx. 25% of the audience were listening to him in the same building some weeks ago) and Thomas. I also asked the audience to raise their hands if they needed translation of some expressions (happened just 2 or three times…once at the very first picture). Thomas presented a power point show with very well selected pictures. He spoke about them and…it is good to be able to read at the same time (Microphone is necessary). He spoke for approximately one hour, and people were very interested and kept him busy for another ½ hour, until I closed the session (it was late). The questions were very accurate and in depth. People came up to me afterwards and thanked for a very interesting evening. Afterwards Yoshi and Jackie had an evening meal and chat at our place. And today we pack for Lindsberg! So, we are very pleased! At a summer gathering at an intentional community in Lindsberg I lead two workshops on successive days, each one beginning with a slide presentation. These were titled, Building Resilient Communities: A New Paradigm for Community Development, and The Global Financial Meltdown: Its Causes, and Opportunities for Localized Restructuring. The participants in each of these sessions were few in number but enthusiastic. As it happened, I was in Sweden at the right time to participate in the Almedalen Week on the island of Gotland. This has become an annual event that brings together a wide variety of business people, politicians, academics, grassroots activists and ordinary folks. You can learn more about this remarkable event at http://www.almedalsveckan.info/. I had no official role in the Almedalen proceedings, but was able to attend a few of the 2,000+ organized sessions and got to shake hands and chat a bit with the U.S. Ambassador to Sweden, Mark Brzezinski (son of Zbigniew Brzezinski who was National Security Adviser to President Jimmy Carter). I finished up my Sweden tour in Stockholm, where I was hosted by an American friend who has been living there for several years with his Swedish wife and young son. In Stockholm I got to meet some of the main figures in the JAK Bank, a unique financial institution that since 1970 has been providing interest-free loans. They together with a few other groups organized an event for me which attracted a sizeable crowd, where I repeated the presentation I gave in Gothenborg. My photos from Sweden can be found at Sweden 1, and Sweden 2. I may at times complain about it, but I love Britain, and this time I had the opportunity to be in the Lake District at a time when the weather was simply superb (“the first real summer we’ve had in seven years,” the locals told me). That workshop was preceded the day before by a gathering in which most of the same “world experts” came together to “clarify an action research agenda, explore ideas for collaboration, begin grant mapping,” and provide “feedback on one key new initiative (Eurocat).” Then, that evening, there was a public event titled, Starting Your Own Currency: Why and How? sponsored by (IFLAS ) in association with Lancaster’s Ethical Small Traders Association. This event featured a keynote presentation by John Rogers followed by my response and a general discussion. Along with a few other colleagues, I had the pleasure of enjoying a few more days of discussions and Jem’s hospitality at his home overlooking Lake Windermere. I reported earlier that one our close associates, Will Ruddick, along with several of the local currency activist there in Kenya had been arrested and their Bangla-Pesa currency project shut down. I’m happy to report that finally, the charges against them have been dropped. You can read about it here. (A very interesting earlier account that describes their ordeal can be found here. This is great news, not only because the threat of punishment has been removed, but because this important development project may again have a chance to improve the lot of poor micro-entrepreneurs in Kenya and to demonstrate the power of the local credit clearing model in alleviating poverty. The Bangla-Pesa project is the most significant complementary currency project that I am aware of and has the potential to become THE model for other communities to follow. It deserves strongest support. Will adds, We’ve also created this 3 minute cartoon to explain how these programs form an effective barrier against poverty and market stagnation: http://www.youtube.com/watch?v=UaspBGmsdLE Please share widely. Alvin Toffler observed more than 30 years ago that the power of nation states was in decline and predicted that the trend would continue. It is clear that national governments are ceding sovereignty, not to global democratic institutions, but to transnational corporate entities resulting in a New (fascist) World Order that bypass all the checks on power that have been built into democratic governments over the past three centuries. George Monbiot’s recent article, Elite Insurgency, articulates some current features of that shift. And Karen Hudes has revealed that World Bank corruption is an inherent element in the global Elite takeover. After Twenty one years at the World Bank, she has blown the lid off the cover-up of the corrupt global financial regime. Watch this interview with Karen: http://youtu.be/M4VGoXV5vYg . A longer interview in four part can be seen here. “Stakeholder analysis” identifies a “super entity” of ownership and control. All of that is very troubling, but we have a choice—to build our own (democratic) new world order from the bottom up, community-by-community. We cannot be complacent; we must reduce our dependence upon corporate controlled mega-systems, especially banks, and secure the availability of the necessities of life within our local regions. In an unbelievably heavy handed move, the Government of Kenya last week arrested an American aid worker and five local micro-entrepreneurs for operating a complementary exchange system in a poor suburb of Mombasa. The recently launched Bangla-Pesa voucher system is intended to provide additional liquidity that makes it possible for unmet needs of local residents to be satisfied out of their own excess productive capacity. In just two weeks of operation, the amount of goods and services traded among the members of the Bangla-Pesa network increased substantially. Now, the program is shut down and six people are facing seven years in prison. Why? Is this simply a case of ignorance on the part of government officials, or an attempt to keep poor people poor and dependent upon inadequate or even exploitative systems that are controlled by bankers and politicians ? The answer to that will become clear as this case develops. Your help is needed to get this matter resolved in favor of freedom, justice, and rationality. Here is the official appeal from American aid worker Will Ruddick. End Africa’s dependence on Aid through Complementary Currencies. Eradicate poverty and keep six people from seven years in prison. Click here to support this program and watch our videos. Bangla-Pesa, a complementary currency program in one of Kenya’s poorest slums, needs your help. This innovative program gave participants the ability to create their own means of exchange so micro-business owners could trade what they have for what they need. In two weeks, the program already showed great success. But the Central Bank of Kenya has deemed the program illegal and is pursuing a legal battle against its organizers, despite enthusiastic community support. · Alfred Sigo a youth activist. · Emma Onyango a grandmother and community business owner. · Rose Oloo a grandmother and community business owner. · Paul Mwololo a grandfather and community business owner. · Caroline Dama a mother and volunteer. · Will Ruddick a new father and program founder. We need help raising funds for legal fees and to bring this program back to life so it can help people throughout Africa in expanded form via mobile phones. Our goal is to raise 47,000 Euros over the next 47 days.